Operation Rainfall is, among other things, a letter-writing campaign hoping to bring Japanese Wii games like The Last Story, Pandora's Tower, and Xenoblade to the U.S. Nintendo already politely declined on its Facebook page. That's not the only nice way it's saying no. How Badly Do You Want The Last Story, Pandora&apos;s Tower and Xenoblade for Wii? It's also responding to letters, writing things like, "I can see why you want to see games like Xenoblade, The Last Story, or Pandora's Tower released here in the Americas, but at this time we have no new information to offer or announcements to make regarding these games." 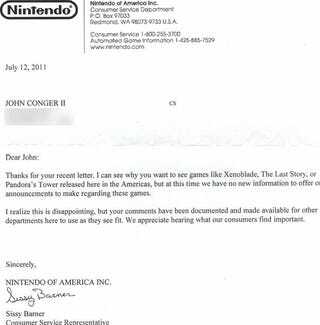 Nintendo's snail letter reply also noted, "I realize this is disappointing, but your comments have been documented and made available for other departments here to use as they see fit. We appreciate hearing what our consumers find important." Pretty much what Nintendo wrote on its Facebook page! It's also the same canned response Nintendo is using for its emails. Still find it rather depressing that Nintendo seems to think it wouldn't be worth its effort to bring over at least one of these games for American players. Or at least ditch the canned response. Though, I guess there's only so many ways Nintendo can say no.